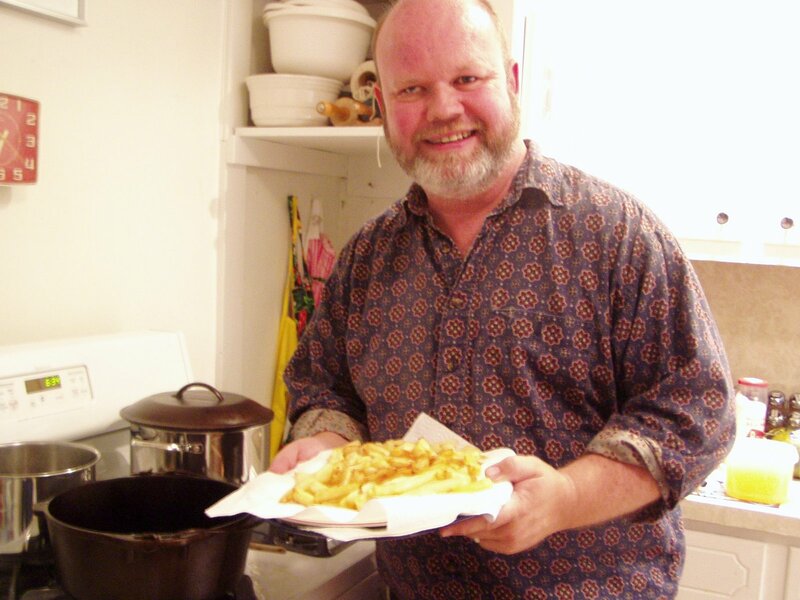 Fred doesn’t really cook, but when it comes to frying he has finely honed instincts that rival that of the greatest chef. Here he is holding the fabulous French fries he made on Saturday. That’s his grandmother’s Dutch oven to the left, which seems to help in the process. 1. Peel and cut potatoes to desired size and shape. Place in pot of water to rinse off starch. Drain. 2. Heat oil until very hot. Place potatoes in hot oil and cook until just soft but still light in color. Fred’s art also got mentioned in Access Atlanta. And I made stock. The excitement never stops. There is a young turkey thawing in the refrigerator, along with some butterfly pork chops. Things should pick up next week in the cooking realm. This entry was posted in Our Life, Vegetables. Bookmark the permalink. ← It’s 1974. Do You Know Where Your Children Are?